If you had invented a 'Resizenator' with a super shrinkafying ability, you’d definitely shrink the robot submarine you’d also invented, right? And then you’d go exploring, right? But would you go exploring inside your brother’s gut? What if it would save the world? Sally Tinker, the world’s foremost inventor under the age of twelve, is on a mission. Her little brother, Joe, has just drunk a test tube filled with smart bots (also invented by Sally), and if Sally and her best friend Charli don’t stop them, they’ll implant a smartCHIP in Joe’s brain, making him the smartest (and likely evilest) baby ever!! This is the third instalment in James Foley’s brilliant graphic novel junior fiction series. 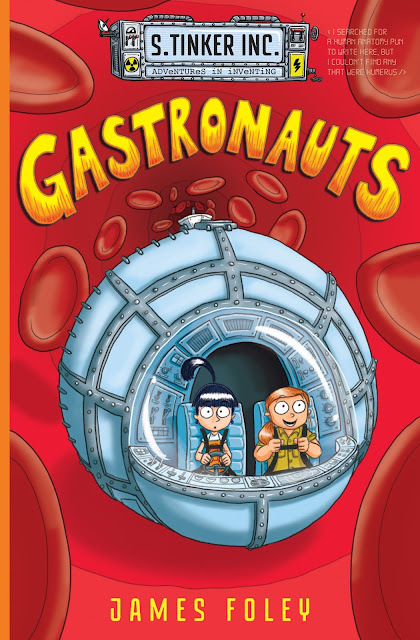 Following Brobot and Dungzilla, Gastronauts is a fun and fast-paced adventure through the human body. It’s infused with humour for both kids and adults, and it’s action packed. As a graphic novel, the story is mostly told through illustrations and dialogue. But Foley has made it super easy for kids to follow, with speech bubbles galore and helpful lines connecting words to characters. TRUE FACT #73: BLOOD IS THICKER THAN WATER, BUT MAPLE SYRUP IS THICKER THAN BLOOD, SO TECHNICALLY PANCAKES ARE MORE IMPORTANT THAN FAMILY. If you know young readers who love action, adventure and comedy in their books, this series is the perfect fit. It’s also great for kids who prefer more pictures and less words. Fun, funny and filled with farts, Gastronauts is a wild ride not to be missed.